When your heart is open and you send heart energy out to others and to the world, you open yourself up to allow more loving energy to come to you. And when you direct your heart energy in a specific way towards what you want, you attract to you what you're focusing on…money, a relationship, you name it. Heart energy naturally raises you to a high vibration and allows you to release attachment to your desires. When you surround yourself with it, doubts, fears, worries, and resistance fall away as you become one with the Universe. Once you are surrounded, you want to send heart energy out to what you want to manifest. When you do so, you are giving your desire a tremendous amount of energy that will draw it right to you. When you use heart energy to manifest, you naturally focus into abundance and everything flourishes around you. When you feel your desire in your heart, as if it is a part of you, you have reached a state of oneness that can cause instant manifestation. When this happens, it's more important than ever to keep your heart energy expanded. There is a natural tendency to want to stop and let go, but this only blocks your receiving your desire. You want to allow the energy to continue to flow through you, to surround you, and to focus it on what you want. You should feel a loving, peacefulness all around you and inside of you. You should feel connected to the world around you. You should feel judgments slip away as you begin to perceive things around you differently because you're now looking at the world with your heart, not your mind. You are very expanded and open to good things coming to you. Things will begin happening with synchronicity…just falling into place effortlessly. You aren't trying to do anything by yourself. Heart energy is doing it for you. Your true power is in your heart. Whatever you focus heart energy on, you become, and it becomes your experience. 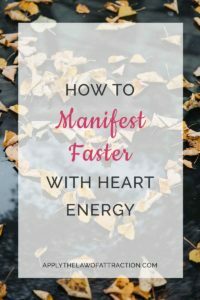 That is how you use heart energy for faster manifestation. How do you learn to do heart energy? I read your other arricles but still don’t understand how to expand my heart energy.